What startled watching journalists was that the assailant was a middle-class woman with a child, and the minister was Mary Hanafin, who looks like the convent-schoolteacher she once was. 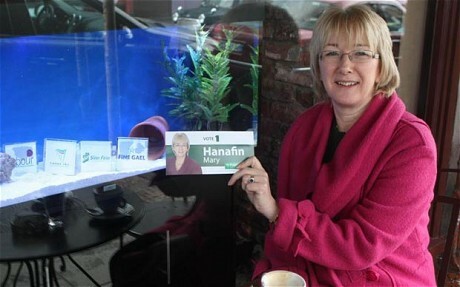 In her ministerial career, Miss Hanafin has been confined to women's jobs - Education, Social Welfare and now Tourism, Culture and Sport  and was never accused of dining and drinking with the dodgy bankers and property developers that along with the low-interest rates enforced by membership of the euro have ruined her country. The former teacher is, however, a perfect example of the kind of politician that has dominated modern Irish political life, few of whom are economically literate or have experience in business or administration. The Cabinet which disastrously mishandled the economic collapse consisted almost exclusively of teachers, lawyers and career politicians. Taoiseach Brian Cowen, for instance, was a solicitor before inheriting his father's seat at 24; his deputy, Mary Coughlan, was a social worker before succeeding her father at 21; Brian Lenihan, the finance minister, was a barrister who won his father's seat at 37; and while Micheal Martin, now leader of Fianna Fail, became a full-time politician after a year as a teacher. Mr Martin fought a valiant election but was unable to save Fianna Fail from its worst-ever election result and a near-wipeout, for the party has nowhere to hide. It has been in power for 61 of the last 79 years, and apart from 2½ years in the mid-1990s, continuously in government since 1987, when the electorate chose to give the blatantly corrupt Charles Haughey a second chance as Taoiseach. The Irish are a conservative and pragmatic people, historically untroubled by corruption and wedded to clientelism: it was no accident that the Catholic Irish in America proved to be stunningly effective machine politicians. A politician's ability to do favours for his constituents - 'pull strokes'  was what mattered; the multi-seat constituencies created cut-throat competition - often between representatives of the same party. The electorate winked at on-the-take politicians as long as they delivered. This time, Fianna Fail not only failed to deliver, but through cronyism and incompetence wrecked the country. The abiding image of the glory days of the Celtic Tiger - as Bertie Ahern distributed largesse like a drunk who has beaten the casino  is of the Fianna Fail tent at the Galway races. It was there that bankers and property developers lowered pints or sipped champagne with politicians and together toasted light-touch regulation and the social partnership which gave lavish pay deals to the public sector in exchange for keeping Ireland virtually strike-free. When disaster struck, the government bet the country on its toxic banks. At its lowest ebb, Fianna Fail could always rely on the tribal vote that had its roots in civil war politics. This time, fury drove mass desertion. What has astonished the political class is that in Friday's election, Fianna Fail voters crossed the historic divide to vote for Fine Gael, the old enemy, something that would have been unthinkable had there not been an economic catastrophe. Yes, there was a big angry vote for Labour, independents and for Sinn Fein (whose economic strategy is to default on all debts, use the pension reserve fund to reverse cuts in social-welfare benefits - at present roughly twice those in the UK - and then demand that burned bondholders re-finance Ireland), but essentially, the electorate decided it wanted to play safe with Fine Gael. So what will it get? Enda Kenny, who will be Taoiseach, was a schoolteacher for four years before he succeeded his father as a member of the Dail, or TD. His party is no more ideological than Fianna Fail, and is similarly awash with teachers and lawyers, but is more middle-class and honest. It has, however, almost no experience of government. Labour, which will almost certainly be its coalition partner, is led and dominated by the trade unions which are at present resisting change or cuts in the bloated, secretive and inefficient public services. It is doubtful if a look at the books will turn its leader into Nick Clegg. The only hopeful signs are that Kenny is a team-player, that a few of his team are able and that they may have grasped that following orders from the European Central Bank will end up with national bankruptcy. Since the German paymasters are still desperate to keep the euro intact, there is some room for renegotiation of punitive interest rates. And were the new government radical enough to take the issue to the people in a referendum, there would be overwhelming support for measured and sensible defaults. Ireland is out of love with the EU: the days of sullen acquiescence with its diktats could just possibly be over.